You are a GLCA-affiliated faculty, instructional staff or undergraduate student receiving an OHLA microgrant? Congratulations! Welcome to the OHLA Collective. The student will undertake a full-time oral history project including planning, collection, processing, and archiving for the duration of a term of study at their institution. Expectations of the sponsoring faculty mentor include overarching support and mentorship during the fieldwork period, to ensure timely completion of the project’s goals, and co-authorship of a summary case study highlighting decision points and successes. Together, the team will produce at least two process-oriented blog posts highlighting aspects of the project and approaches taken for an audience who is curious about project design and community engagement. Some forward facing digital story or exhibit will be represented on www.ohla.info in the student projects. Funded faculty will articulate, gain campus (IRB) approval for, and implement a digital humanities project that utilizes oral history driven by a curricular tie (a course on the books that you desire to teach in innovative and experiential ways). They will write at least 5 process-descriptive blog posts for an audience of curious faculty who are attempting similar pedagogical approaches, sharing your syllabus and any assorted materials, and writing a peer-reviewed case study summarizing the endeavor and your key decision points in conclusion. Some forward facing digital story or exhibit will be represented on www.ohla.info in the faculty projects. When you accept an OHLA award, you commit to attending at least one training institute where you will learn the OHLA method, from the best practices of oral history and how the digital age complicates informed consent, to tactical interview methods, to managing file workflows, and hands-on training in digital tools for building exhibits. 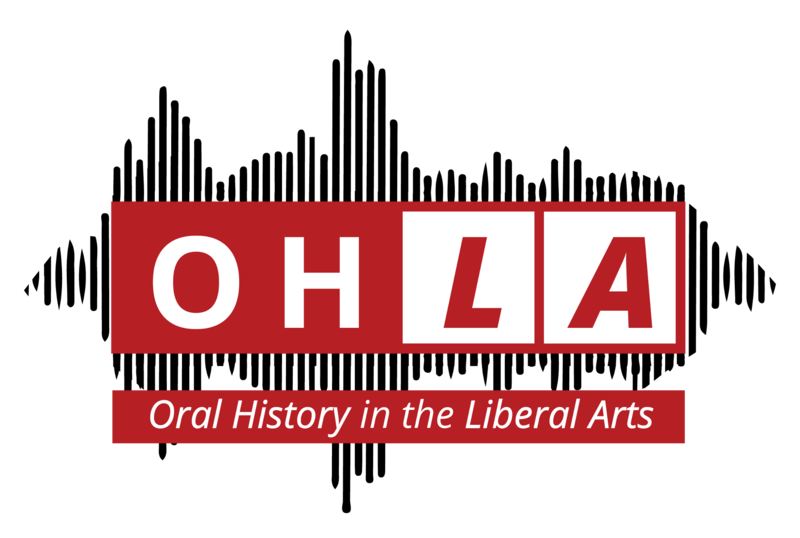 Visit the OHLA homepage at ohla.info for a wide variety of resources and reflective essays written by participating OHLA faculty, students, digital librarians, and instructional technologists. Expect frequent new content— second year project teams are building their projects and resources currently behind the scenes, while third year project teams are just onboarding. We recommend scrolling the homepage or “Explore” at the upper left of the site. Locating our Practice is a series of essays written by faculty who discuss their disciplinary backgrounds, teaching and research interests, and how they came to engage in community-based learning with interview and digital tools. Start here for inspiration on how the OHLA method might impact your teaching and learning or structure the undergraduate research you support. Project Design: You can download and edit OHLA’s project statement, release form, and metadata log to use in your own project planning here, or view a sample OHLA microgrant application by OHLA co-director Ric Sheffield and a student interested in documenting Latinx experience at Kenyon here. Find out how OHLA co-director Brooke Bryan uses the project statement and release form to structure her student’s projects, read up on the differences between informed consent and copyright release, and how to approach your campus IRB in the monumental post Interviewing 101: A few resources for teaching undergrads how to interview for public-facing digital projects. Within one term. 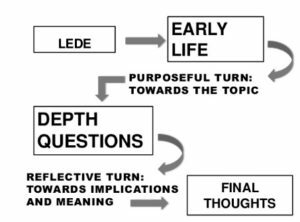 This post includes resources to teach her Abbreviated Life Story Method that emphasizes managing the time-space of the interview and preparing a minimal number of deliberate questions. See through the eyes of undergraduates as they reflect and share advice for doing community-based interview projects like how to identify interviewees for an emergent project, reaching out to a potential interviewee by email, preparing for a good interview, and taking fieldnotes. Plan for what happens after the interview with Kenyon digital librarian Jenna Nolt’s toolkit providing a bird’s eye view of collecting metadata and managing files, consider what kind of digital tool might serve the project you’d like to build with this tool overview, and check out an innovative use of Excel for indexing interviews you want to work with but don’t wish to publish or archive. Jump into our massive collection of Oral History Metadata Synchronizer (OHMS) tutorials with the first of a student-produced video training series here, and consider how can OHMS can support the visualization and navigation of your bilingual projects here. Lean into Emily Yochim’s podcasting assignments and tutorials here.